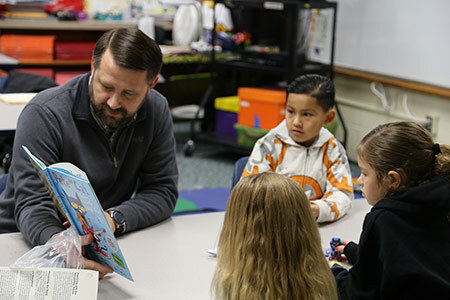 With the Rotary Club of Arkansas City recently donating $1,000 to each elementary school in Arkansas City to be used towards Early Childhood materials to be used in the library or classroom, members of the Rotary Club took time to read to students at Jefferson Elementary on Tuesday. The Rotary members will read at all six Arkansas City elementary schools during the month of February. “One of our goals was to get our members into the grade schools and this was a great way of doing that,” Rotary Club of Arkansas City president Dan Deener said. Deener was joined by Cowley College president and past Rotary Club president Dr. Dennis C. Rittle. 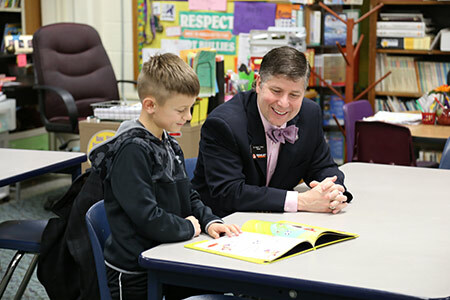 Fellow Rotary Club of Arkansas City members Shane Larson and Anita Judd-Jenkins also took time to read to the Jefferson Elementary students. “Rotary is known for international projects, but we also want to be known for achieving local projects,” Judd-Jenkins said. 2018-2019 Rotary Club of Arkansas City Officers and Board members are: Dan Deener, Dr. Dennis C. Rittle, John Sturd, Zack Stoy, Clayton Pappan, Lara McGrew, Dennis Voth, John Farrar, Tim Bain, Ty Voss, Mickey Thompson, and Chris Dancy. Along with Dr. Rittle and Larson, Cowley College administrators Dr. Kori Gregg, and Dr. Gloria Walker also serve as Rotary members of the Arkansas City Club.